Anna Koukkides-Procopiou is affiliated as Research Associate and member of the Advisory Board, with the Center of European and International Affairs, University of Nicosia and has recently received funding by the State Department and the German Ministry of Foreign Affairs to complete a project on Gender and Inclusive Security, within the framework of the Cyprus Problem. Currently working towards the attainment of her PhD in leadership and crisis-management, she holds First Class degrees (B.Sc.) in History and Economics from University College London, with postgraduate studies at the London School of Economics (M.Sc.) on International Relations. She is also a recipient of the Executive Development Diploma for Professionals (mini-MBA) from the Cyprus Institute of International Management and various other professional business training qualifications, (including the Engel&Volkers Academy in Hamburg, Germany). She has in the past held a number of managerial positions in the Lanitis Group of Companies, one of the largest employers in Cyprus, later on serving as corporate consultant for a number of international and local clients, including the Bank of Cyprus. She has served as Project Manager for two EU-funded pan-European projects, Women Fit4Business and Gender Diversity in Decision-Making Positions and as an Executive Director on the Board of Directors of DIAS Media, a public company and the largest media house in Cyprus. An active member of civil society, she now serves her second term as President of AIPFE Cyprus- Women of Europe, which she also represents on the Board of the Cyprus Women’s Lobby. She is a member of Business Professional Women-Cyprus, a founding member of the Cyprus Literacy Board, as well as the founder and facilitator of two Lean-In Nicosia Circles, affiliated with Sheryl Sandberg’s Lean-In Org. 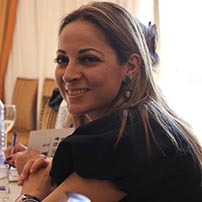 She currently sits on the panel of judges for the Madame Figaro Women Awards, is a member of the Cyprus Advisory Board of the Global Entrepreneurship Network and a mentor for the newly-launched Impossible Pitch project for start-ups, having in the past served as team coach for the Young Entrepreneurs/Junior Achievement Project.